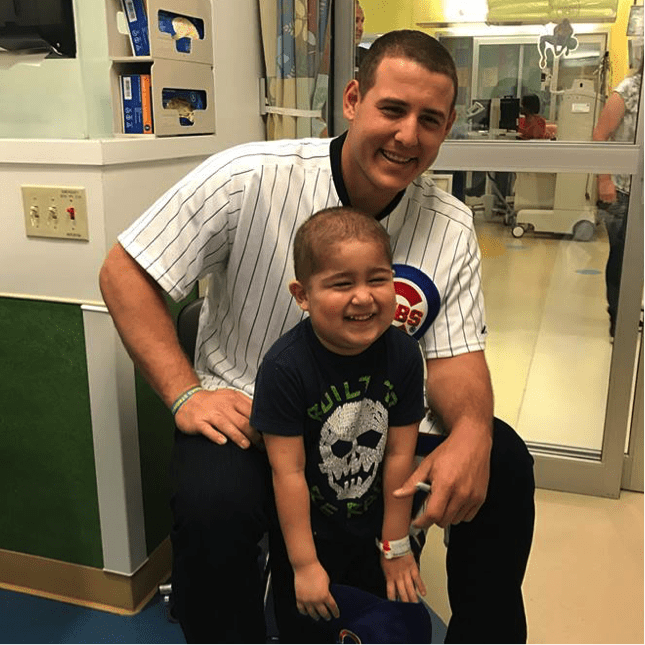 A World Series champion and three-time All-Star, Chicago Cubs first baseman Anthony Rizzo is more than an athlete. Anthony is a hero both on and off the field. He always has a positive attitude and smile on his face. Committed to giving back to his community, he founded the Anthony Rizzo Family Foundation in 2012. The organization is dedicated to not only raising funds for cancer research but also providing financial support to children and their families as they battle the disease. Family is everything to Anthony, and he recognizes that a cancer diagnosis becomes a fight for the whole family. Anthony is no stranger to this battle. He was diagnosed with Hodgkin’s lymphoma in 2008 at the age of 18. Fresh out of high school and beginning his baseball career, the news came completely out of left field. Anthony faced his battle head on with perseverance. For him, the hardest part of treatment wasn’t the intense chemotherapy, but rather watching his parents struggle financially. He knew he had to stay strong for them. After six months of treatment, Anthony was told he was cancer-free and could return to a normal life. But Anthony could tell things were different. He reached the other side of cancer determined to do something for families still fighting. 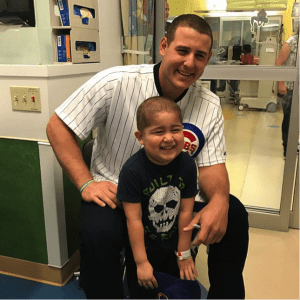 It wasn’t long before he created the Anthony Rizzo Family Foundation to support cancer patients and their families. We’ve partnered with the Rizzo Family Foundation since 2013. To date, over $478,000 in financial assistance has been provided to over 1,300 people impacted by cancer thanks to the foundation’s tireless efforts. These funds ensure patients and caregivers can get to treatment, keep food on their tables, pay their utilities and stay in their homes. Each year, the Roberto Clemente Award is presented to a Major League Baseball player who “best represents the game of baseball through extraordinary character, community involvement, philanthropy and positive contributions, both on and off the field.” It came as no surprise when Anthony was once again nominated for the award this year. His generosity, hard work and dedication to families battling cancer never ceases to amaze and inspire us. Help us honor Anthony and cast a vote so he can win this prestigious award. Fan voting is open from October 2-6. Visit www.mlb.com/roberto-clemente-award and show your support today!